Devices for removing parasitic ticks should be more readily available for people to buy, a GP has said. Fort William-based Dr Jim Douglas has called on shops in the Highlands to stock the aids. Lyme disease, an infection that can cause arthritis and even death if untreated, can be transmitted to humans through a tick bite. 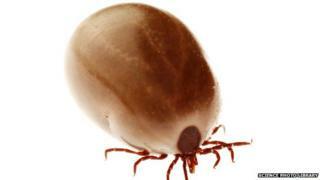 Mountaineers and walkers have been warned that the mild winter may encourage the spread of ticks. Dr Douglas said specialised devices were preferable to other ways of removing ticks. He said dealing with them using fingers, or tweezers, risked squirting bacteria into the body. The tools lift the tick from underneath, avoiding this. There are several kinds on the market, the GP said. One looks like a clear plastic credit card with a magnifying glass and another resembles a tiny claw hammer. Dr Douglas said: "Sadly, these devices are not as readily available as I think they should be. "That's why I would ask shopkeepers and outdoor tourist venues throughout Highland, and indeed Scotland, to carry stocks of these devices." He added: "We should get into the habit of having one in the first-aid kit or home or at the bottom of your rucksack so that they are readily available to us, as the general consensus is that if ticks are removed within 24 hours then there is no problem." In May, the Mountaineering Council of Scotland said the mild winter may have encouraged the spread of ticks. It said hillwalkers had encountered large numbers of the pests during treks into Scotland's hills and mountains.